Located in Grand County in the eastern part of the state of Utah, Moab is a highly popular tourist town that attracts big numbers of visitors for nature and recreational purposes. The Colorado River flows alongside the city, with the Utah-Colorado border not too far away and various national parks in the surrounding area. Moab is the county seat of Grand County and covers an area of 4.1 square miles. The city is located in the Mountain Time Zone and has a population of approximately 5,200 people. The origin of the city's name is subject to debate, with some believing it was inspired by a Native American word, while others claim it's a Biblical reference. In either case, the area was settled by Mormons in the early 19th century as a trading fort at the Colorado River crossing. It was called Elk Mountain Mission at the time, but attacks from Native Americans resulted in the area being abandoned. Years later, in 1878, the city of Moab was founded on the same spot and became a strong trading location until more Colorado River crossings and railroads were established. 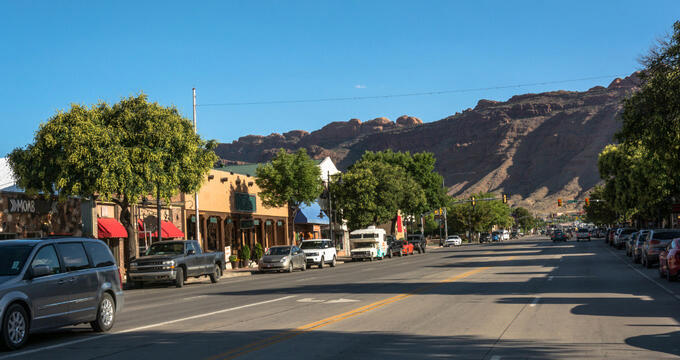 Moab was a simple farming town to begin with, but the economy expanded over the years to include mining, helping to boost the population and lead to the construction of new buildings and schools. As the years went by, more people began to learn of Moab's existence as the area was used for Hollywood movie shoots and became a popular tourist spot due to its proximity to various natural sites that are perfect for mountain biking, hiking, rafting, climbing, and more. Elevation is an important geographical statistic that tells us how high or low an area is in relation to sea level. It can be used when talking about towns, cities, mountains, and more, and the elevation of a location has a direct effect on its climate, with higher elevations resulting in lower temperatures in general. The elevation of Moab is 4,026 feet (1,227 m), which is much higher than the national average of 2,500 feet (760 m). Many towns and cities around the United States were founded in coastal regions and have quite low elevations of under 500 feet (152 m). Moab’s high elevation is due to its inland location and the fact that Utah is one of the highest states in the nation. When listed in order of highest average elevation, Utah is actually the third highest state in the country. Only Colorado and Wyoming are higher than Utah, with the Beehive State having an average elevation of 6,100 feet (1,860 m). This means that the elevation of Moab is actually lower than the state average. The highest point in all of Utah is Kings Peak, which has an elevation of 13,534 feet (4,125 m), while the lowest point in the state is the Beaver Dam Wash, not far from the Utah-Arizona border, which has an elevation of 2,180 feet (664 m). Moab is therefore much lower than the state’s average and highest point, but has an elevation that matches up with many of the state’s biggest cities. The state capital of Salt Lake City, for example, has an elevation of 4,226 feet (1,288 m), just slightly higher than Moab. Other big cities around Utah are all situated at similar elevations, with some key examples being West Valley City, which has an elevation of 4,304 feet (1,312 m), Provo, which has an elevation of 4,551 feet (1,387 m), and West Jordan, which has an elevation of 4,373 feet (1,333 m). The city of Moab has an arid climate with hot summers, cold winters, and dry conditions almost all year long. Less than an inch of rain is expected on average per month in Moab, but some snow can fall from December through to February each year. The coldest month of the year is January, which has average lows of 20°F (-7°C), while the warmest month is July, with average highs of 99°F (37°C). Temperatures can drop quite strongly in Moab after sunset, with nights being a lot colder than days in general. The key attraction in Moab is its appeal to outdoor enthusiasts. It's a highly popular spot for mountain biking, hiking, camping, and more, with the highly popular Slickrock mountain bike trail just outside the city and both the Arches and Canyonlands national parks right nearby as well. The annual Moab Jeep Safari event is another highlight of the city, with kayaking and climbing also popular in and around Moab.